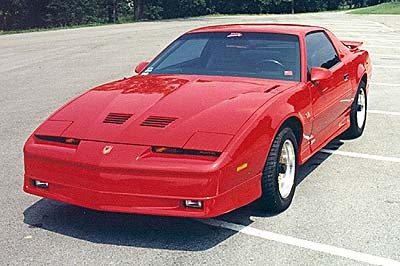 Our red GTA was built in June, 1988 in Van Nuys, CA and was shipped out on July 5 to enter the GM dealer network. So far, I have not been able to locate the the build sheet for the car, but I do have the assembly line check tag showing that car's systems were all operational, and it is dated 6/24/88. According to GM, most cars are produced within forty-eight (48) hours prior to this label being printed. I purchased it on September 23, 1988 in Little Rock, AR. 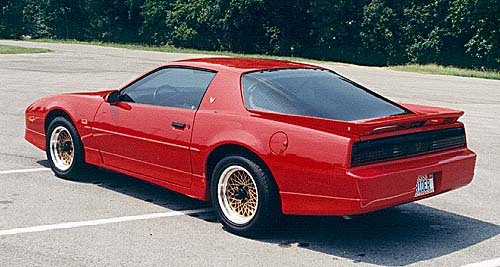 It was the last 1988 model in Arkansas when I got it. The retail sticker price was $19,938; the amount I paid was $17,623......... plus the extra Major Guard warranty package. These nice RONAL R9 wheels were on the car when I bought it new and I tried to get the dealer to either admit to me what had happened to the original wheels or replace them, but they never would do either one. I always figured they were swapped for someone who had bought a T/A and wanted the gold wheels. Anyway, the dealership personally covered the Ronal wheels with an addendum under my 100,000-mile GM Major Guard warranty, so they were not an issue for me. However, after a few years, the old gremlins started tapping me on the shoulder........ "Hey, Frank......... in case you hadn't noticed........ your car's not right........". Surely you know what I'm talking about, right? The wheels from GM were "out of sight", so we just patiently waited for a nice used set to come along. Classic Industries came to the rescue though, with their new OEM GTA rims available through their catalog. For about the price of one wheel from Pontiac, we were able to buy a whole set from CI. After a repaint in the correct 52P Gold Metallic wheel color and all new caps/hardware, we were in business, original-equipment-wise........ So, after ten years, the car has been returned to its factory original appearance. So far my modifications have been limited to "under the hood". I have replaced the plenum, intake runners, and throttle body with high flow units from Lingenfelter Performance Engineering. The change in the car's personality has been impressive; now it seems always ready to go..... RIGHT NOW! The infamous TPI "stumble" upon hard acceleration is now gone for good. 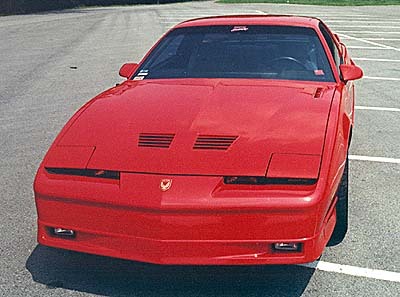 I have also added the SLP Cold Air Induction kit as well, and consider it to be money well spent. The installation was a bit trying sometimes, but I was able to complete it myself. 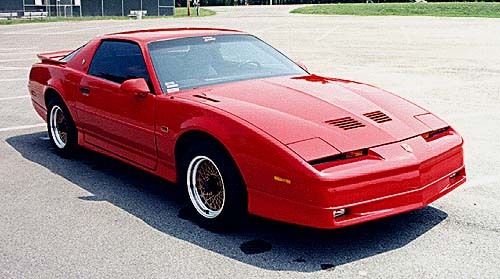 Other modifications include a Hypertech Cool Fan Switch and a Flowmaster Force II exhaust system, which offered the single most noticable gain in performance. 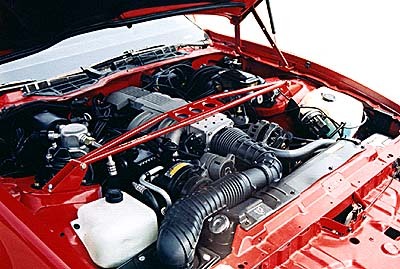 The latest addition is the red Hotchkis Strut Tower Brace in the above engine picture; it has made a world of difference in the structural rigidity of the car's front end. There is nary a rattle to be heard out there now. The next item on my agenda is the addition of an aftermarket ignition system from either MSD or ACCEL. I have never had my car on a dragstrip, so I can't give any performance slip times, but it is certainly no slouch. A G-Tech meter may be in our future together..... The real-world performance is what matters to me the most anyway, i.e. how long it takes to get around that semi, etc. I can say that I am pleased with where my car is right now without ever having taken it to the track, and I plan to keep it that way. To each his own, right? 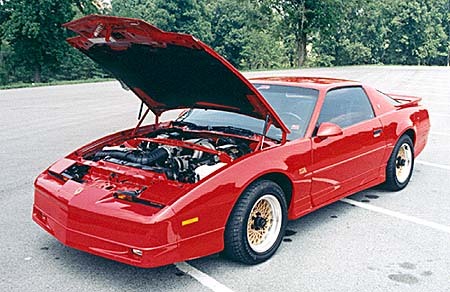 As far as shows and trophies, the car has won two Second Place trophies and garnered a single First Place nod last summer at a local show in the GM Production Car 1984-96 class. 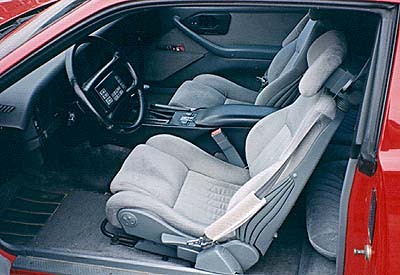 Our GTA is one of the 1,940 Bright Red GTAs built in 1988 (22% of production); in addition, 2,717 GTAs were equipped with the Medium Dark Gray custom cloth interior (27% of production), like both of our cars have. A total of 8,956 GTAs left Van Nuys with the big-gun 5.7L TPI V8; this represents some 88% of the total GTA production in 1988. So this is our hatchback GTA; I hope you enjoyed this feature on the real reason that the GTA Source Page exists. This car is what started all of this......!